Jackie co-founded iCarol in 2004 after working as a helpline volunteer at a Distress Center in Canada . With a background in Engineering, Technology and Marketing, Jackie is COO and Director of Marketing for iCarol. As this year begins to wind down and the American Thanksgiving holiday is upon us, I like to pause and think back on the year and see if there is a central theme to what I am most grateful for. Usually it’s a challenge to pick one thing, but this year the answer floated easily to the top. This year I am most thankful for education. Education rises to the top of my list this year for several reasons. Firstly, Neil and I have two children of whom we are exceptionally proud. For them right now, it is all about their education- we like to remind them that it’s their job to learn. Even at their young age, they understand how important their education is and are willing to do whatever it takes to succeed at it (ok, ‘willing’ might be too strong a word 🙂 ). Our children’s education is going to open doors for them their whole lives and help them become well balanced and empathetic contributors to society. It does not escape me that the opportunity for education is not equally available to all. For my children’s education I am very thankful. The next impact of education comes right here with the iCarol team. We grew significantly this year; adding new employees, strengthening our infrastructure to propel our growth and adding new initiatives to help educate and support our clients. With this radical pace of evolution, I watched in awe as my team brainstormed, collaborated, and learned new tools and techniques to implement change and manage all of this growth. These are some really clever people! Their education and experience were integral to this year’s successes. We come from varying backgrounds, most of us with helpline experience, some with degrees in Psychology or Social Work, others in Computer Science, Engineering, or Business, and this diversity ultimately helps us as we work to the common goal of growing our company and improving our product for our clients. For the iCarol team’s education I am very thankful. And most importantly I am inspired by the role of education within helplines. iCarol supports all manner of help organizations- from crisis and mental health; to information and referral; from addiction to animals; from the very young to the very old. It is astounding to reflect upon what it takes for helpline organizations to become the agents of change and support that they are. Volunteers, staff, directors and board members have all traveled the path from awareness, to self-education to educating their communities to educating their ‘callers’ on their options. I think of the endless hours of training that have been invested in phone and online support counselors, the constant seeking of new information that can help callers, and how driven our clients are to expose themselves to new technologies to improve services. For how education creates help, I am grateful. 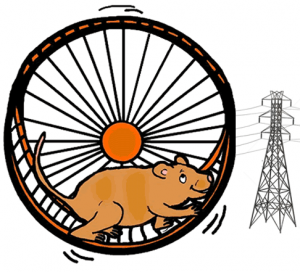 iCarol goes green – hamsters to power all servers! Housed in PETA-certified humane habitats, the hamsters will be fed an organic diet and be given ample time in a play yard when they are not on shift. Every two days they will be given milk baths and groomed until their fur reaches a sheen. “All this pampering results in enthusiastic and energetic hamsters, running to produce a steady stream of 120-volt electricity that can be combined and fed directly into one of the high-powered servers” says Client Support Manager Carmen, “as long as they don’t chew through the wires!” added Support Specialist Dana. New Helpline? Member of THA? Start right with the benefits from iCarol. By Neil McKechnie, DCO eNews, June 2009 The Distress Centres of Ontario are embarking upon an exciting data capture project that will provide province-wide data and analysis to its leaders about caller demographics, issues, call volume trends and more. I can proudly say this will make Ontario and its DCO member centres one of the most progressive regions anywhere.